Celebrate the start of Easter at Passion in the Square, a free recreation of the dramatic events surrounding the story of the crucifixion and resurrection of Jesus. Over 70 actors are taking part in Passion in the Square, covering the betrayal of Christ by Judas, as well as the arrest of Jesus and his trial before Pontius Pilate, the play comes to a climax with the crucifixion of Christ and his ultimate resurrection. Although Passion in the Square recounts a story set in ancient Rome, there'll be plenty of state of the art technology in place to make sure that everyone in Trafalgar Square can follow all the events as they unfold. Radio microphones will make sure that you can hear what's going on, and there will also be large screens to make sure that nobody misses out on any of the drama. 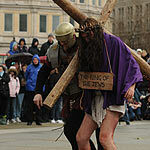 Passion in the Square takes place at Trafalgar Square from 12pm and 3.15pm, Friday 18th April 2014. The event is free to attend.